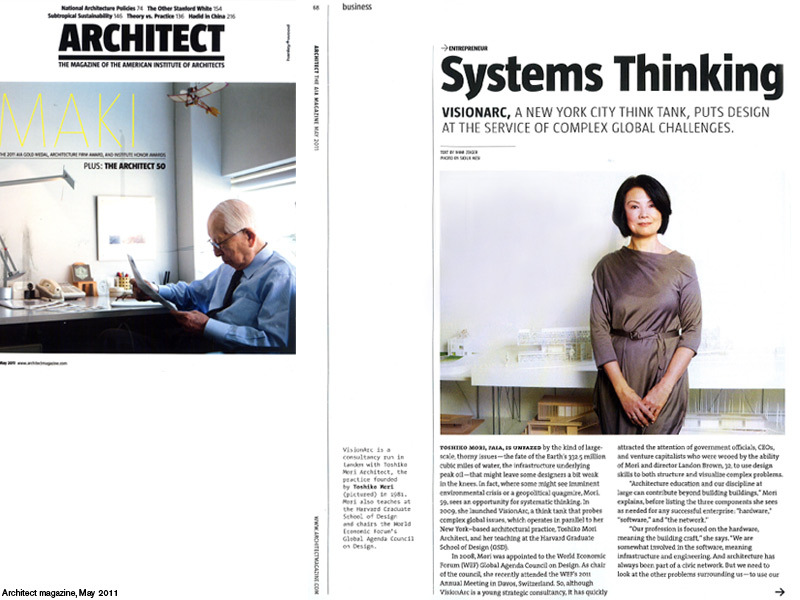 In the May, 2011 issue of ARCHITECT magazine, VisionArc was profiled in the entrepreneur section. Mimi Zeiger sat down with VisionArc Founder, Toshiko Mori and Director, Landon Brown to discuss our recent work, global challenges and the role of design in assuming unique leadership capabilities. Here’s a link to the article. The original text is below. Systems Thinking: A New York City think tank, puts design at the service of complex global challenges. VisionArc is a consultancy run in tandem with Toshiko Mori Architect, the practice founded by Toshiko Mori (pictured) in 1981. Mori also teaches at the Harvard Graduate School of Design and chairs the World Economic Forums Global Agenda Council on Design. Toshiko Mori, FAIA, is unfazed by the kind of large-scale, thorny issues—the fate of the Earth’s 332.5 million cubic miles of water, the infrastructure underlying peak oil—that might leave some designers a bit weak in the knees. In fact, where some might see imminent environmental crisis or a geopolitical quagmire, Mori, 59, sees an opportunity for systematic thinking. In 2009, she launched VisionArc, a think tank that probes complex global issues, which operates in parallel to her New York–based architectural practice, Toshiko Mori Architect, and her teaching at the Harvard Graduate School of Design (GSD). In 2008, Mori was appointed to the World Economic Forum (WEF) Global Agenda Council on Design. As chair of the council, she recently attended the WEF’s 2011 Annual Meeting in Davos, Switzerland. So, although VisionArc is a young strategic consultancy, it has quickly attracted the attention of government officials, CEOs, and venture capitalists who were wooed by the ability of Mori and director Landon Brown, 32, to use design skills to both structure and visualize complex problems. Design Blind Spots 2050, one of VisionArc’s first endeavors, exemplifies this approach. A research project, exhibition, workshop, and video commissioned by DesignSingapore Council and presented at the 2009 International Council of Societies of Industrial Design World Design Congress in Singapore, it suggests that there are unseen linkages between international economies, population centers, and the environment. Or, as the project distills them: production, mobility, and resources. By using the example of environmentally destructive oil-sands mining in Alberta, Canada, as a case study, Mori and Brown identified areas where strategic design could address critical issues at a top level and ultimately create a new mode of practice. “Architects see spaces in plan, elevation, and section; we have a way of analyzing problems in a three- or four-dimensional way. We can slice through an issue that may not connect in plan,” Mori says. In their case study, issues went far beyond the standard purview of architecture and included the environmental impact of pipelines on natural habitats; existing mining technologies; mine workers and the health of populations living near the oil sands; and policies governing mine operations. VisionArc’s research led to proposed solutions for the near future, such as new regional legislation and localized pollution-monitoring by nearby communities, and longer-term visions such as remediated forests and low-impact transportation. “We mine data that is already there and rigorously and imaginatively translate it in order to find potential connections to industry and natural resources,” is how Brown characterizes the VisionArc process. Which is not to say that architecture itself falls out of the equation. VisionArc produced a study last year for the Ocean Energy Institute in Rockland, Maine, a think tank and venture-capital fund addressing offshore renewable energy. The study included the proposed development of a 50,000-square-foot R&D and venture-capital operations facility, the need for which arose out of VisionArc’s comprehensive research on the impact of offshore wind energy on Maine’s economy and environment. If there is any ambivalence in the VisionArc model, it is here, where altruism meets business-development opportunities. Presently, VisionArc is a small, self-sustaining counterpart to Mori’s firm that is run by Brown, who brings in consultants and interns as needed. As it grows into a more robust enterprise, there are sure to be tensions between the social mission that drives VisionArc and the bottom line of conventional practice. (Mori’s 11-person firm is very much engaged in traditional practice, having recently completed a building for the Syracuse Center of Excellence in Environmental and Energy Systems, in Syracuse, N.Y., and the vistors’ center at Frank Lloyd Wright’s Darwin D. Martin House in Buffalo, N.Y.) Mori speaks of VisionArc as a platform for systems research and a growing network of firms and institutions; although it’s self-sustaining financially, this is an untested business model. Like Mori, Tim Brown, the CEO of IDEO, is also a member of WEF’s Global Agenda Council on Design. His book, Change by Design: How Design Thinking Transforms Organizations and Inspires Innovation (2009), is often cited as a bridge between the worlds of business and design. Indeed, VisionArc’s agenda can be seen as part of the “design thinking” trend (see Mark Lamster’s “Business Philosophy?”) as well as part of a slower architectural drift toward research-driven work, which began in earnest in 1998, when OMA founded its own think tank, AMO. Once considered a holding area for Rem Koolhaas’ more academic exercises in datascaping and branding, AMO is now engaged in top-level consulting on a global scale. In February, the firm released The Energy Report, a study on renewable energy for 2050 developed with the World Wildlife Federation and the sustainability-minded consultancy Ecofys. Mori is not interested in carrying the mantel of design thinking, which she categorizes as often limiting itself to the “hardware” side of things, to products and goods. She’s after the application of architectural thinking to global policy, politics, economics, and business. Recently, she and Landon Brown were in discussions with members of the WEF and the Japanese prime minister’s office about a study called the Carbon Portal, for the design of a system of incentives and monitoring and enforcement mechanisms, to track (and reduce) regional and national carbon footprints in Japan. When the earthquake and tsunami struck, the two redirected their efforts toward the design of risk-response mechanisms. “As we had already been exploring concepts for interconnected tracking systems … we repurposed this model, but with a focus on how such a system might be employed in a crisis context,” Brown says. In October, Mori was instrumental in organizing the WEF’s first Design and Global Challenges conference and workshop at the GSD. The daylong event brought together architecture students, Harvard faculty, and WEF experts on trade, human rights, population growth, and the international monetary system. The workshop, split into six cross-disciplinary working groups, pushed the students beyond the cloister of design, exposing them to the languages of economics, business, and law. Asking students to engage with the multiple crises facing the world expands their architectural education and primes the next generation of practitioners.